The Christmas season is upon us; a quick glance at the social media of a handful of Church of God congregations suggests we are a Movement that knows how to celebrate! Certainly, the birth of Jesus gives us many reasons to celebrate, and that celebration has taken the form of hanging of the greens services, advent readings and candlelighting, choral cantatas, Christmas pageants, caroling, dinners (also known as potlucks, pitch-ins, and carry-ins! ), and much, much more. 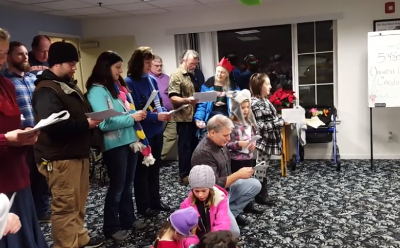 Because the gift of Jesus is meant to be shared with as many people as possible, Church of God congregations have come up with a variety of creative means to share the reason for the season. A number of churches have already reported lives won to Christ, too! The following are just a few of the ways Church of God congregations are celebrating. 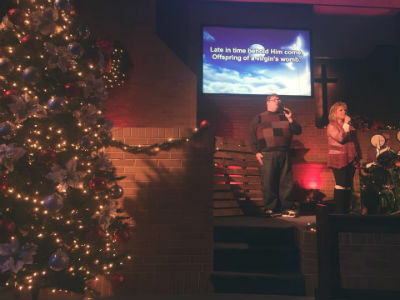 First Church of God in Knoxville, Tennessee, using the [hashtag] #WeAreBetterTogether, has come together on several occasions this Christmas season to fellowship and simply do life together. From the variety of delicious dishes brought to the annual Christmas dinner, to the impromptu Christmas game night following their last council meeting of the year, it was apparent that this church is a body of believers that knows church is more than just a Sunday morning experience. Instead of going separately, several members went to the theaters together to watch the new Christmas movie The Star. Community was evident, and reinforced by the [hashtag] #DontDoLifeAlone. Yep, we need each other, in our local churches, and across the Movement. Christmastime worship at Knoxville First Church of God. It’s not dinner, but breakfast that was on the menu at New Covenant Church of God in Franklin, Ohio. The “Merry Christmas Breakfast” was a community event involving numerous volunteers from the church to encourage the community and plant seeds of faith. “What a joyful and blessed time it is to make new friends and share the love of the Messiah!” they posted. Among other Christmas activities, the church, like many others across the Movement, participated in Operation Christmas Child. TBA Church volunteers delivering gifts to a local elementary school. Florida may be better known for palm trees than pines, but the Church of God there would no doubt rather sing “O Holy Night” than “O Christmas Tree,” anyway! TBA Church in Lakeland is one example of such spirit. Because Christ gave of himself, they were eager to give of themselves to the community. 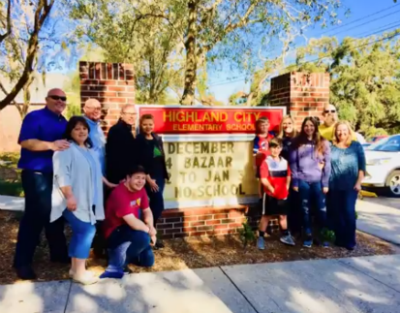 Highland City Elementary School was overwhelmed to receive the Angel Tree gifts delivered personally by several from the church. 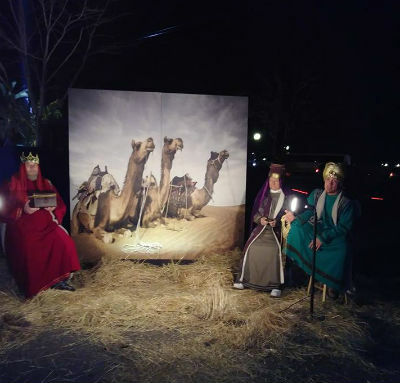 Thousands of people benefited from the eighteenth annual “Miracle of Christmas” drive-through nativity at Crossroads Church of God in Yuba City, California. Featuring fifteen scenes, the experience took drivers beyond the birth of Jesus all the way to the cross and empty tomb. As the church put it, the Bible “came alive” in the free presentation, woven together with scriptures and live actors. Seabird Chapel (Bandon, OR) will carol again to shut-ins with churches beyond our Movement. Because, #JesusIsTheSubject! Scheduled for Christmas Eve, a free toy giveaway awaits families in the community of Macon, Georgia. Community Church of God, pastored by Jason McClendon, offers brand new toys as part of their music-filled production on Sunday morning. To ensure every child receives a toy, the church has developed an online form parents can fill out and prepare for a blessing. The only question that remains is who will receive the greater blessing—the children and their parents, or the congregation. Did your church participate in a special Christmas activity or outreach this year? Let us know about it. Send a brief description* to chognews@chog.org. Thank you! Across North America, and around the world, God is on the move in the Church of God. Join the movement. Reach our world. Donate today at give.jesusisthesubject.org. *REMINDER: The offices of Church of God Ministries will be closed from December 20 through December 26 in observance of the Christmas holiday. This entry was posted in All Church of God and tagged Advent, California, Christmas, community, Florida, Georgia, holiday, Ohio, Oklahoma, Oregon, outreach, Tennessee. Bookmark the permalink.